Discover the benefits of installing granite countertops into your kitchen. Whether you are installing countertops into your new kitchen or just renovating your current structures, you need to take time choosing the material. You want a countertop material that is extremely durable as well as aesthetically pleasing. Granite is one of the strongest materials on the market as well as one of the most in-demand among homeowners. If you are looking for a countertop material for your kitchen, look no further than granite! One of the major benefits of investing in granite countertops is that they are highly durable and long-lasting. They are perfect for installing in your kitchen because they stand up well to everyday wear and tear. Granite is also heat resistant, so you won’t have to worry about a hot pan damaging your countertops. The hardness of granite is what makes it a desirable material for kitchen countertops. 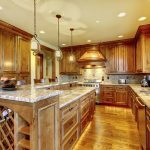 When it comes to choosing a material for your kitchen countertops, granite is one of the most unique and beautiful materials on the market. Each slab of granite has its own unique look and design, so you are guaranteed that your countertops are different than from any other structure. You can choose your countertops from a wide range of colors and styles, so they can be as simple or bold as you would like. With so many design options to choose from, your countertops will enhance the look and feel of your kitchen immediately after installation. If you seal your granite countertops, then they will be very simple to care for throughout the year. Sealed granite countertops do no absorbs stains, so cleaning your countertops will be a very quick and easy process. All you have to do to clean granite is to use mild soap and water or cleaning solution that is made specifically for natural stone. This entry was posted on Friday, May 25th, 2018 at 10:27 am. Both comments and pings are currently closed.